The sitar (English pronunciation: /ˈsɪtɑːr/ or /sɪˈtɑːr/; Hindi: सितार Urdu: ستار sitāra pronounced [sɪˈtaːr]) is a plucked stringed instrument used mainly in Hindustani music and Indian classical music. 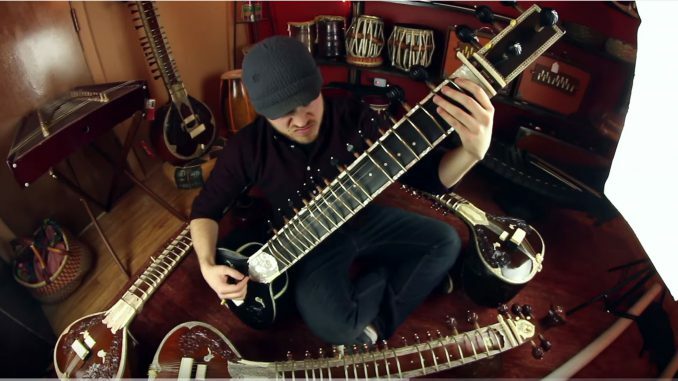 The instrument is believed to have been derived from the veena, an ancient Indian instrument, which was modified by a Mughal court musician to conform with the tastes of his Mughal patrons and named after a Persian instrument called the setar (meaning three strings). The sitar flourished in the 16th and 17th centuries and arrived at its present form in 18th century India. It derives its distinctive timbre and resonance from sympathetic strings, bridge design, a long hollow neck and a gourd-shaped resonance chamber. In appearance, the sitar is similar to the tanpura, except that it has frets. Used widely throughout the Indian subcontinent, the sitar became popularly known in the wider world through the works of Ravi Shankar, beginning in the late 1950s and early 1960s. In the 1960s, a short-lived trend arose for the use of the sitar in Western popular music, with the instrument appearing on tracks by bands such as The Beatles, The Doors, The Rolling Stones and others.